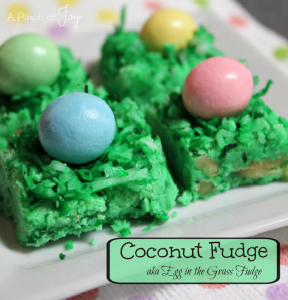 Coconut fudge is a cream cheese based candy that is colorful, fun and so easy to make! Use a 3 ounce package of cream cheese or cut three ounces from a larger 8 ounce piece. Food coloring has so many options that it’s hard to give a measurement. If you’ve used a particular kind – paste, deep color, neon or regular – you probably have an idea of the intensity each produces. If not – go slow. You can always add more, but subtracting doesn’t work! I prefer the paste colors that are used in cake decorating for the fudge, but –hey, grass is green in any medium. And for making coconut grass, a liquid coloring seems to work best. This fudge will get soft if it is out of the refrigerator and uneaten for more than a hour or so. Usually it disappears so quickly, that’s not a problem. 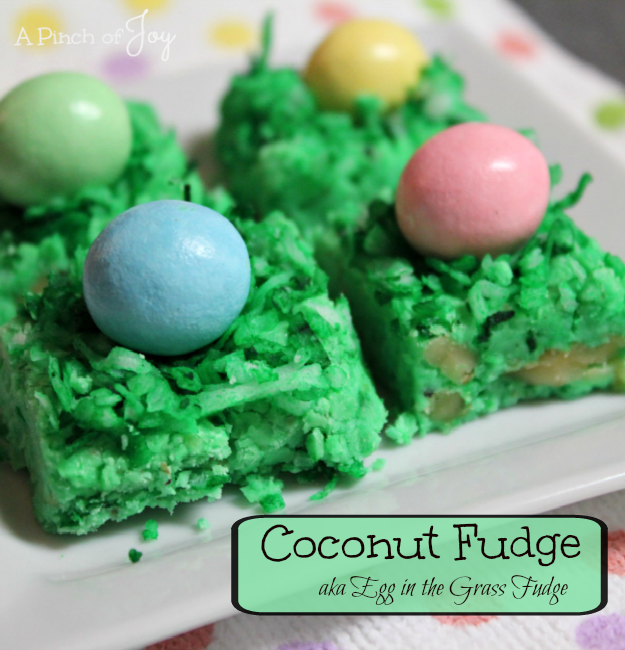 A colorful, fun and easy to make cream cheese fudge for spring celebrations! Butter 8x8 inch pan lightly. In small bowl, beat cream cheese, sugar and extract until smooth. Add food coloring a bit at a time, mixing until desired color is achieved. Mix in coconut and chopped nuts. Place ½ cup coconut in plastic zipper bag with 2-3 drops of food coloring and shake until coconut is colored. Press gently into top of fudge mixture and add candy so that one piece is in the middle of each planned square of fudge. Refrigerate at least 30 minutes or until firm, before cutting and serving.